There’s a new buzzword in health news these days, and it’s “nanotechnology.” If the word sounds like the kind of technology that builds robots, it is in some ways. However, when scientists are talking about nanotechnology, they are referring to materials that are very, very tiny. One nanometer is one-millionth of a millimeter. So what is nanotechnology exactly, and why is it being used to help people feel better? Nanotechnology apparently has the possibility of delivering drugs or natural medicines to specific cells using nanoparticles. This approach has a number of benefits over the traditional practice of swallowing a pill and letting it make its way slowly through your body. Delivering medicine with nanoparticles could help lower the amount of medicine you have to take, and it can also lower the prescription drug side effects you have to suffer through. In effect, nanomedical delivery of drugs centers on developing nanoscale-particles or molecules to improve drug bioavailability. Bioavailability itself is important, because it means that your body gets medicine exactly where it needs it and where it will be most beneficial to your recovery. 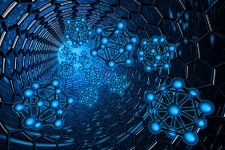 Nanotechnology is a huge field that is currently being explored by most of the top research facilities in North America. The future of nanomedicine might one day involve each of us assembling biocompatible devices that could detect, evaluate, treat, and report medical information to a doctor. It sounds like science fiction, but medical science has already taken the first steps toward realizing this future. In a recent clinical trial performed at the Pharmaceutical Research Institute in Albany, New York, researchers wanted to find out if nanotechnology could deliver polyphenols directly to sites in the body where cancerous tumors had started to grow. Polyphenols are natural compounds found in plants, fruits, chocolate, and beverages, such as tea and wine. To date, most of the research around polyphenols shows them to have anticancer activity in cells. RECOMMENDED: Four ways polyphenols can save your life. One problem with polyphenols, however, is their short half-life (meaning they degrade quickly) and low bioavailability. For this reason, the researchers are suggesting the use of nanoparticles to enhance the delivery of polyphenols to tumor sites. Based on their research so far, nanomedicine may be a very useful tool in targeting cancer cells. Stay tuned for more on this cutting-edge treatment. Khushnud, T., et al., “Potential Role of Naturally Derived Polyphenols and Their Nanotechnology Delivery in Cancer,” Mol Biotechnol. February 1, 2013.